As a boy I recall fishing the Tay on numerous occasions and never once were the catch statistics discussed nor did that deter from the sheer excitement and exhilaration of going to the salmon river. At best the ghillie might choose to inform you of the previous season’s catches but more often than not nothing would be mentioned. This would make you wonder how on earth they ever managed to sell their salmon fishing back in those days as catch statistics seems to be the 'be all and end all' these days for marketing purposes. Here’s what really sells a salmon river in my professional opinion. The beauty of the riverbanks, the hospitality of the ghillie, the smell of the wood burning in the fishing hut’s fire, the sounds of the ducks or oyster catchers, the hypnotic flow of the river, the splash of a salmon, the swirl of a trout, watching the salmon fry & parr in the margins, the interaction of other fishing guests and most importantly of all just getting away for the day(s) into a more natural arena where we all once belonged. Sure there are Scottish salmon beats where you can more or less be guaranteed an offer from a fish at least once during the day. If you’re good enough and understand the salmon take you’ll convert it to hit objective but the reality is that in the vast majority of Scottish salmon beats there’s always an opportunity of a fish somewhere on the beat at some point in the day. When you’ve spent enough time on any salmon river you’ll fully appreciate what I’ve just stated about there always being a chance no matter where you are fishing if you’re astute enough. If you don’t have thousands of pounds to invest in your fishing that’s fine as you’ll still be in with a sporting chance if you take your venue advice from someone who’s been long enough in the industry to know and is deliberately ‘selective’ of the venues they represent. This delicate process involved in selecting salmon beats to market goes much deeper than the surface layer and focusses more on the daily operational & customer service standards which often vary considerably from venue to venue. 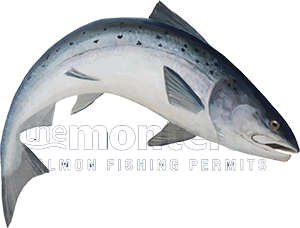 Here’s what an agent should look for in a salmon beat (or encourage a beat to lift their operational game to comply with). A friendly informative beat ghillie, a clean & tidy salmon fishing hut, well maintained riverbanks, segregation between fly fishing areas and spinning fishing areas (Tay only), quiet boatmanship with no pool crashing bow waves, a quick boiling kettle, riverbank ghillie interaction at least a few times (even if briefly), fair boat share for where boats are included in the let, accurate fishing advice, ghillie monitoring of his rods for slow movers through pools, fair salmon pool rotations and generally keeping a watchful eye on beat fishing operations to ensure a great client experience. There’s a little bit of professional insight into what it takes to select a Scottish salmon beat wisely assuming the basic operational standards are in place. Most anglers would probably not be aware of the kind of selection process but this is the type of insight you can expect from an agent who has served their time on the riverbanks as a head ghillie prior to becoming an agent. A professional ‘time served’ salmon fishing agent’s beat recommendation can be valuable if you hadn’t previously been paying attention to these finer points of salmon beat operational standards and selection.